The premise is basic enough to be easily understood on a sort of Urban Legend sort of level: Dumb hippies camping up in the sticks for a summer growing season are waiting to harvest $2 million dollars worth of dope when a team of federal narcotics agents stumble upon their bivouac. They shoot the only good looking woman willing to bare her breasts for the camera and are promptly slaughtered for their efforts by the hippies, who aren’t all peace & love after all. After the agents are reported missing cynical federal drug officers decide to dust the crop of weed with an experimental defoliant known to have toxic side effects. I actually remember stories about weed being dusted by the government with paraquat that would make you gag blood when I was a teenage troublemaker, and always wondered if this movie was a source of that urban myth. So the feds hire a down on his luck loser to do it, planning to off him afterward to cover it all up. 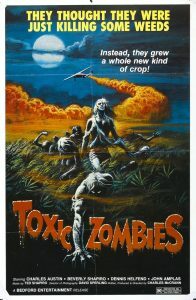 The hippies get exposed to the defoliant and mutate into ravenous, bloodthirsty zombie type maniacs. They go on a rampage murdering and partially devouring anyone they come upon and the film does a good job of trotting a regular supply of fresh victims onto the location sets. Meanwhile, the hero (writer/director/star Charles McCrann) and his girlfriend happen upon a young girl and her mentally handicapped brother as they wander through the woods looking for frogs or whatever. The four flee the toxic zombies and take up with a survivalist hermit living in the woods who must have been Ted Kazinski’s next door neighbor (even though the film was made in Pennsylvania). They fight a losing battle against the toxic zombies & find themselves on the run again, only to come face to face with the scurrilous drug agents, who plan to murder everybody and cover up the event. All we need is that cigarette guy from the X-Files and we’d have a nice little modern day post Vietnam era paranoia parable here. That’s the movie in a nutshell. What works are the zombie attacks and the low budget middle of nowhere locations that were chosen. There’s also a decent pulsating electronic musical score that suggest somebody had seen a couple of Lucio Fulci movies — And it turns out, director/star Chuck McCrann was indeed a horror movie buff and sort of made this on his own with some friends & business contacts, one of whom was George A. Romero actor John Amplas, himself a native Pennsylvanian known to work on risky, low budget projects. There’s certainly a “home movie” sort of quality to the proceedings, which I say works in the movie’s favor. Mr. McCrann was apparently something of a financial entrepreneur and likely raised the funds for the project himself, giving the film a nice independent/regional edge to it. There are no big stars, the zombie effects and gore makeup are effective yet minimal, and the biggest bill for the project was probably the lab fee for the print. Most of the actors are non-professionals, it was likely filmed on public land with a modest crew, and was indeed apparently so independent of a production that there wasn’t anyone to stick up for it when British authorities outright banned the film in or around 1984. Its legend as a barf-bagger epic banned by assorted heads of state grew far out of proportion to anything the movie actually delivers, resulting in some of the confusion amongst the ranks of my fellow reviewers here. Today the film exists in a sort of limbo. Not public domain but the legal rights to the film are probably undetermined since they likely remained with Mr. McCrann, who it turns out was one of the victims of the 9/11 terror attacks on the World Trade Center, which is where his offices were located. Until the legalities are sorted out the film will remain slipped through the cracks and overlooked, with only its bizarre legacy to recommend it. The only DVD versions kicking around today are sourced from old home video releases. There’s an R rated North American DVD and an unrated print from Japan that shows the complete 89 minute assembly rejected by the MPAA. One offbeat tangent of intrigue here is that the theme of government conspiracy and indifference to public well-being runs through TOXIC ZOMBIES right up to a paranoid survivalist hoarding guns & MREs up in his cabin. Of course its just a coincidence but it adds to the film’s aura of seediness and cynicism. I actually kind of like it too. I adore low budget regional horror and this is probably one of the pinnacle efforts. It deserves to be resurrected and restored, both as a legacy to McCrann’s vision and a great object lesson on how to make a cheap, sleazy, endearing little horror movie for peanuts.